On Friday 26th February, I met with the manager for an informal meeting on how he thought the trip had gone in order to get as much feedback as possible. Your first time here. Have you enjoyed your stay at Desert Springs? Was your accommodation up to standard? How was your dining experience in both restaurants? Were the staff friendly and helpful in the restaurants? “The staff were fantastic; you should congratulate everyone from the kitchen to yourself. Did the football pitch & changing room meet your expectations? How did you find the rest of the Sierra Club sports facilities? Did you use any of the other facilities during your stay? Is there anything we could have done to improve your stay at Desert Springs? Would you return to Desert Springs for future camps? Can you think of anyone I can contact regarding camps? Shunning the Nordic snow as they head south next month to enjoy the desert micro-climate of south-east Spain will be 25 of Norway’s top footballers. 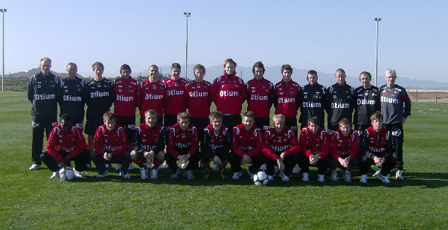 A squad of 22 players and three coaches from Honefoss Football Club – which currently competes in the Tippeligaen, the top tier of Norwegian football, are following in the footsteps of the country’s pioneering second division Bryne Football Club which last year was the first to benefit from the facilities of the Football Winter Training Camp established at Desert Springs. During a four-night stay at the Desert Springs the Honefoss players will benefit from training and coaching on the first international-size quality grass pitch in Almeria. Since it was inaugurated by Sir Bobby Charlton and Sir Geoff Hurst in 2004, floodlights, shower and changing facilities and a referee changing room have been added. More recently, in response to requests from visiting teams, a new hard standing area provides outside space for facilities such as a free weights gym, stretching mats and a medical area. And for the first time this year players will be able to make use of a newly-sewn dwarf rye grass area planned specifically for goal-keeper training and five-a-side games. Simon Coaker, sales and marketing manager at Desert Springs, said that the wide range of facilities available in the resort influenced the decision by Honefoss Football Club to select Desert Springs for its training camp. During Football Winter Training Camps, players can make full use of the 18-hole Indiana golf course and enjoy opportunities to swim, play tennis and use the gymnasium, trim trail, jogging tracks, paddle tennis and beach volley ball courts. They also have access to the resort’s Private Reserve which incorporates a spa, private sauna and jacuzzi suite, personal fitness workout room, games room with bar, and a home cinema. Accommodation for the players and coaches is in some of the privately-owned apartments normally reserved for holidays and short breaks at Desert Springs. When Honefoss visits next month, the resort’s executive chef will be on hand to cater for the special dietary requirements of individual players dining in the resort’s two restaurants – the award-winning El Torrente and the Croc Restaurant, part of the family-friendly Crocodile Club.